Sometimes we get stuck. We hit a bump in the road and get frustrated and "stressed out". To paraphrase the Jews on their way out of Egypt: "We have our enemy behind us and an ocean in front of us. There is no hope". At those times we need to reach out to G-d. But more important is afterward we need to express our thanks and gratitude to G-d for helping us. We see this in the Torah reading of the seventh day of Passover and in the haftorah from Samuel II 22:1-51. The Jews and King David express thanks to G-d for helping them and being there in their time of need. We often know who to call when we are stuck. As a Rabbi, there are countless times when people reach out for help in their time of need. However, how often do they forget to give an update when things work out? I am guilty of this as well. 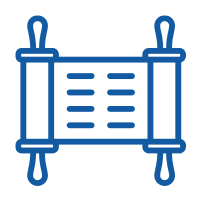 While I try to update people about the impact of their financial and community support, I do not always show enough gratitude, give enough feedback and thanks. 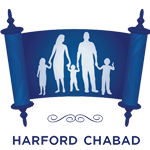 Thank you for reading this, thank you for supporting Chabad, thank you for caring about the Jewish community of Harford and Cecil counties. I hope you can join us for services this holiday or at a time in the near future. Now it is nice to have a meal together, but who really cares that way back when, three THOUSAND three hundred and thirty-one years ago, the Jewish people left Egypt?? Why is the Seder and Passover relevant in 2019? Why would the Talmud say that every year (and every day) a person should see themselves as if they left Egypt today? One answer I find meaningful is that a Jew must remember that the Passover message is always relevant. Every year and every day. Namely, that the Jewish people have a special place on G-d’s radar. The Jewish people, and every Jew specifically, each moment of their lives, are guided by G-d and Divine providence. One should recognize that G-d has a unique plan specific for him. This Divine plan can G-d forbid be manifested in the opposite of revealed good and seem bitter. Hashem’s special attention to the Jewish people quickly removes the negativity in every experience. This is symbolized by the 3 Passover representations: The Pascal lamb (divine intervention passing over the Jewish people), the Maror - bitter herbs (removes bitterness), and the matzah (so fast that the negativity can’t fester). We must remember daily that G-d is in charge. This recognition removes the bitterness in a challenging situation. Additionally, on Passover the verse tells us: “You shall relate it to your child”. We need to make our own homes a place where G-d’s presence is felt. We do not only "do Judaism" outside the house, but our home is a Jewish home. We need to educate our children (by example) about Jewish values. Regardless if they are the wise child or temporarily wicked, if they are a simple one or one who does not know how to ask, it is our duty to see to it that our children feel that they are one of G-d’s children and that they live up to that title through including Jewish practices in their daily life. We will first get a baseline sample. Only then will you drink the liquid sugar, and we will take an additional sample every hour for 3 hours. Your test results will be available in approximately one week. That is how the technician explained the process as we were testing one of our children for lactose intolerance. It got me thinking. Often, when we talk about spiritual growth, we miss the first step - what is our baseline? Where are we spiritually? Only then can we test to see if there are things that we need to improve, if there are things we need to be intolerant of etc. How does one get a baseline? You get a technician; find a friend and ask him to help you identify where you are at spiritually, and then have them help you guide yourself on your journey. Do not measure every minute. After a week, see if you made advancement on the journey, ask the friend how you are progressing. Keep moving forward in the right direction! Perhaps, then, by the time Passover comes (in two weeks), we will be ready to be freed from our limitations.